Kendu Zero Spill waterbowl A fresh new approach to watering cattle in Freestalls: Kendu Zero Spill waterbowls is a permanent, economical solution for providing sufficient water access to all cows. 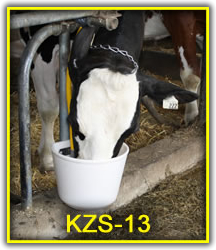 The Kendu Zero Spill waterbowl was designed to replace shallow rigid waterbowls used in tie stalls. Surprisingly many farmers wanted to use them in free stall barns. 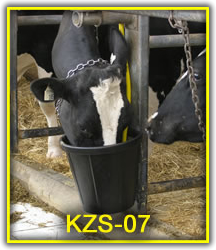 For farms looking to add watering stations the KZS-07 has some unique features that benefit free stall operations. Farmers found that it was easy and inexpensive to create additional watering stations in their barns. With additional watering locations around the barn water consumption could be increased. Flexibility: They can be mounted in walkways to posts or to walls and still allow passage by cattle and machinery. The KZS-07 is made from a flexible synthetic rubber compound. It allows the entire bucket to flex inward when an animal runs into it or brushes by it. Cattle are protected from injury if they are pushed into it. The bucket simply rebounds back into its original shape. High Flow Valve: The KZS-07 is the only waterbowl in the world that can handle unrestricted waterflow. At 50 psi water pressure the valve allows 25 + litres per minute into the bucket. This waterflow for an individual waterer is greater than some valves for multi animal stock tanks. 25 litres per minute water flow matches the top drinking speed of a thirsty cow. A cow that requires 100 litres of water in a day would only require 4 minutes of drinking time. It is very quick for a cow to drink a large portion of their water requirements in a short time. Click to enlarge A high flow tube valve is located inside a deep flexible bucket. The cow activates the tube valve by pushing it with their muzzle in any direction. The water enters the bucket as quickly as the cow can drink but the level of the water stays low in the bucket. 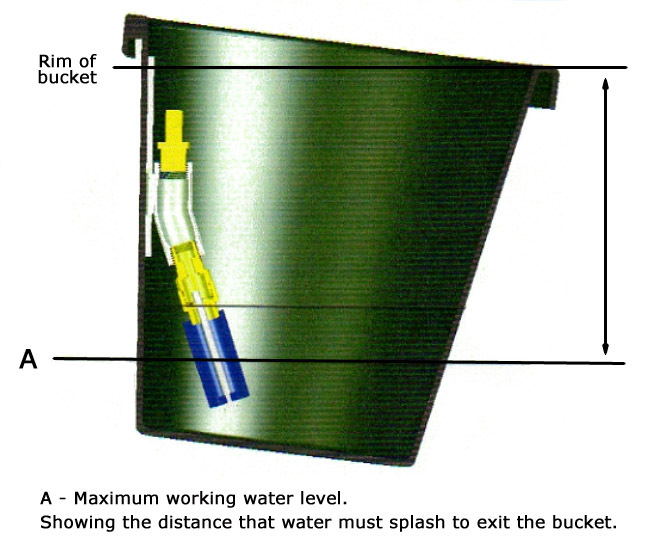 Any splashes are contained in the bucket to keep the area around the KZS dry. The valve is held by a stainless steel mounting bracket and the flexible pail is supported and protected by a galvanized back frame to keep it upright against a post or against a wall. A poly plate supports the pail and minimizes stress on the pail when it is pushed or abused. The most active time for cows to drink is after feeding and after milking. The herd mentality is for the whole herd to want to drink at the same time. There is not enough trough space for every cow to drink at once. While older aggressive cows are drinking, younger submissive cows are pushed away from the trough. If the submissive cows are forced to wait long enough they may choose to find a stall to lie down in. If this happens it may take several hours for a cow to get a drink. Provide additional watering stations in walkways away from the main water troughs. The crowds around the water trough will dissipate because cows will be able to drink in other locations in the barn. Water troughs offer a large volume of water for multiple cows to drink from. Cows must stand close beside one another to drink. A single valve fills the trough while many cows drink from it. One thirsty cow can drink at a rate of up to 30 litres per minute, so if 4 cows are drinking they could drink up to 120 litres per minute. This is far faster than any float valve can keep up with, so a larger volume is required to meet the demand. There are disadvantages to keeping a large water volume open in reserve. A larger more expensive tank is required. The large surface area of open standing water is difficult to keep clean and free of bacteria. To keep the water fresh and appetizing more labour is required for draining or dumping the tank for cleaning. This wasted water must then be dealt with like manure, which means larger storage requirements and more time and fuel used spreading it. There is no need to dump or drain water to keep your water clean!